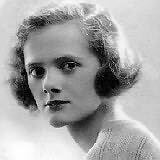 Daphne du Maurier was born on May 13, 1907, in London, England, the daughter of actor-manager Sir Gerald du Maurier. She was a poular novelist known for her suspenseful, romantic and sometimes supernatural plots. Her best known works are Rebecca and The Birds, both adapted to film by Alfred Hitchcock. Du Maurier was made a Dame Commander in the Order of the British Empire in 1969. She died in 1981 in Par, Cornwall, England.